WASHINGTON—The Trump administration expects annual budget deficits to rise nearly $100 billion more than previously forecast in each of the next three years, pushing the federal deficit above $1 trillion starting next year. 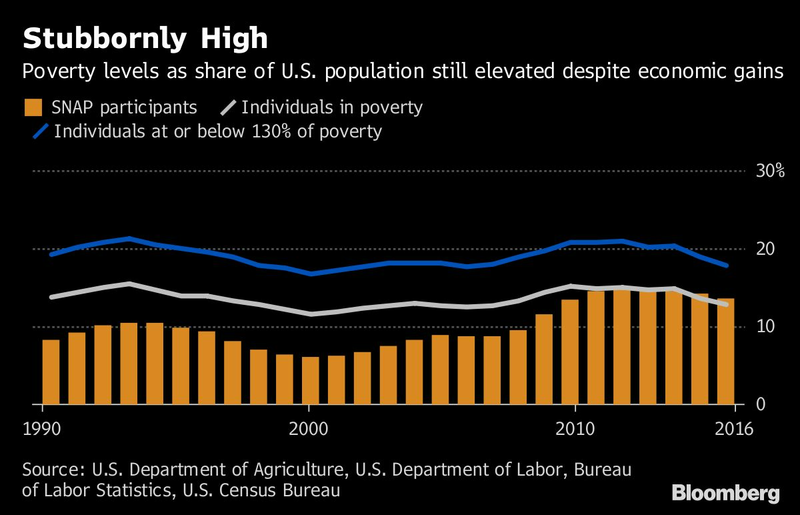 (Bloomberg) — Judging by the number of Americans on food stamps, it doesn’t feel like one of the best job markets in almost a half century and the second-longest economic expansion on record. While robust growth is a bragging point for President Donald Trump and a campaign theme for Republicans trying to break a historical pattern by keeping control of the House and Senate in midterm elections, the rising tide isn’t lifting all boats. Elevated SNAP use displeases congressional Republicans, who want a shift toward more job training in the five-year farm bill that’s taking shape. Democrats say continued support is needed as an uneven rebound leaves behind millions. “The economic recovery took longer to reach people who work in low-wage jobs,” said Dottie Rosenbaum, a senior fellow at the liberal-leaning Center on Budget and Policy Priorities in Washington and a former Congressional Budget Office analyst. SNAP enrollments have remained elevated for years because of higher participation rates in the program, and because the jobless are only one segment of the needy.